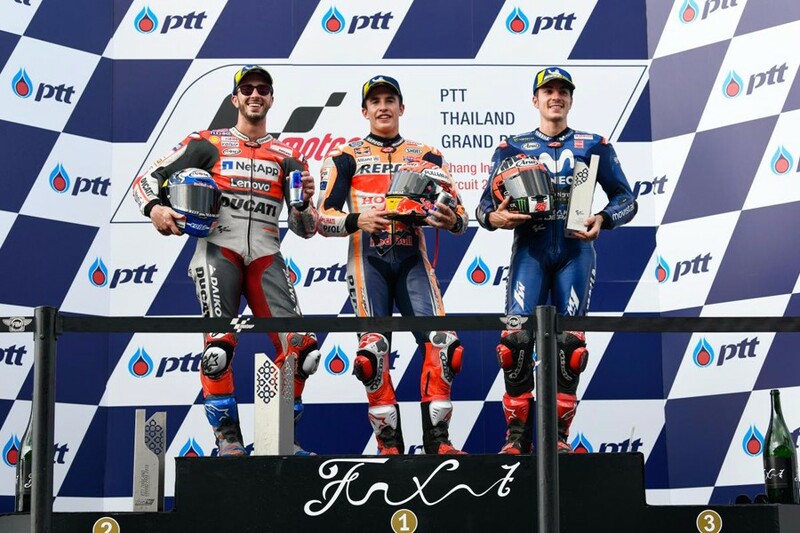 Marc Marquez (Repsol Honda) took the first victory of MotoGP Thailand at Chang International Circuit on October 7, 2018. 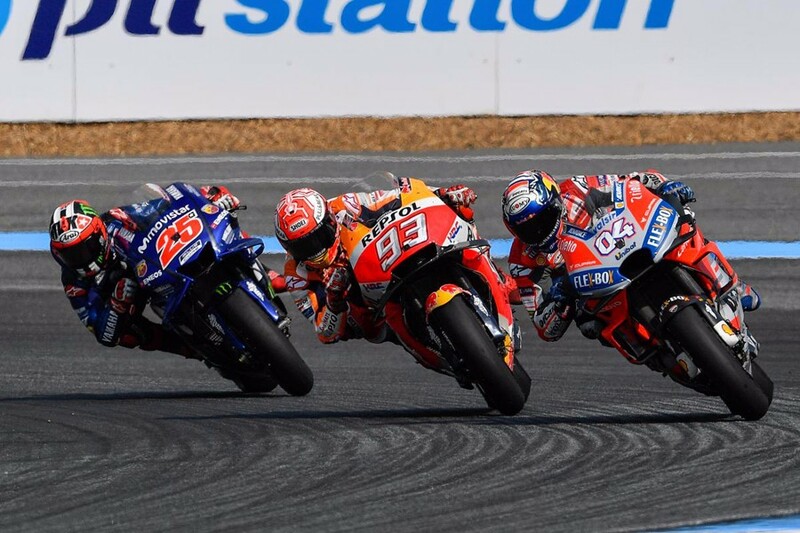 He battled with Andrea Dovizioso (Ducati Team) until final lap, Andrea Dovizioso attempted to pass Marc Marquez at the final corner, but Marc Marquez closed door and received the chequered flag 0.115 seconds ahead of Andrea Dovizioso. This scene seemed like Austrian GP last year. But this time, Andrea Dovizioso could not take the top again unlike last year. 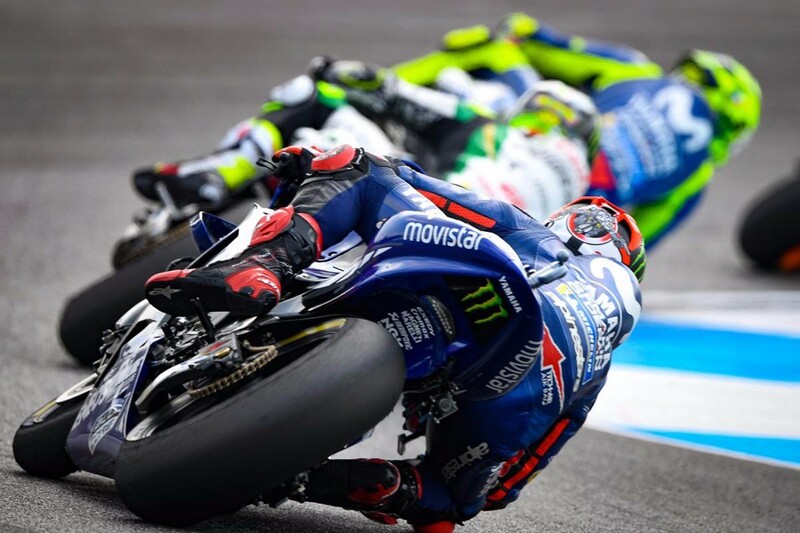 The third place was Maverick Vinales (Movistar Yamaha) ahead of his team mate Valentino Rossi (Movistar Yamaha). 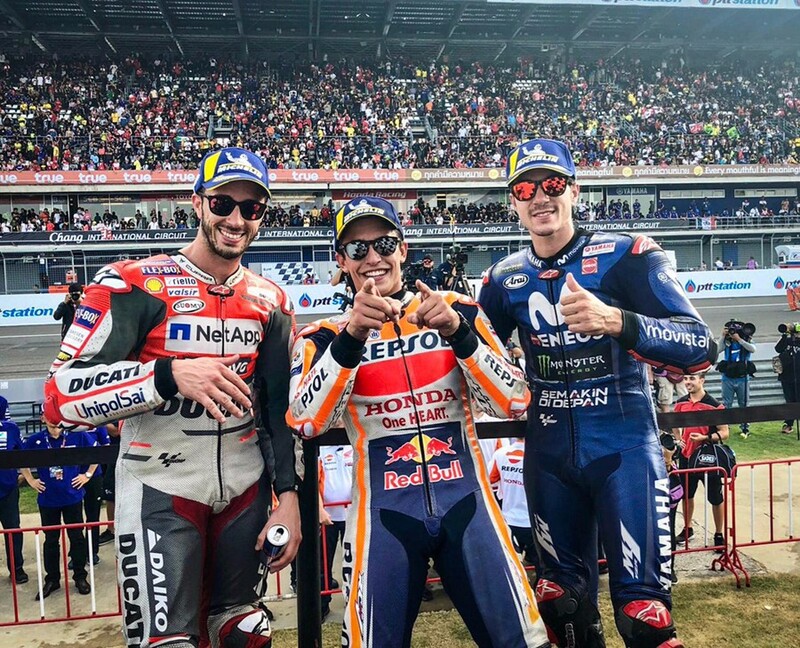 Maverick Vinales was his first podium since German GP. Valentino Rossi picked up his best result since the Czech race in August. 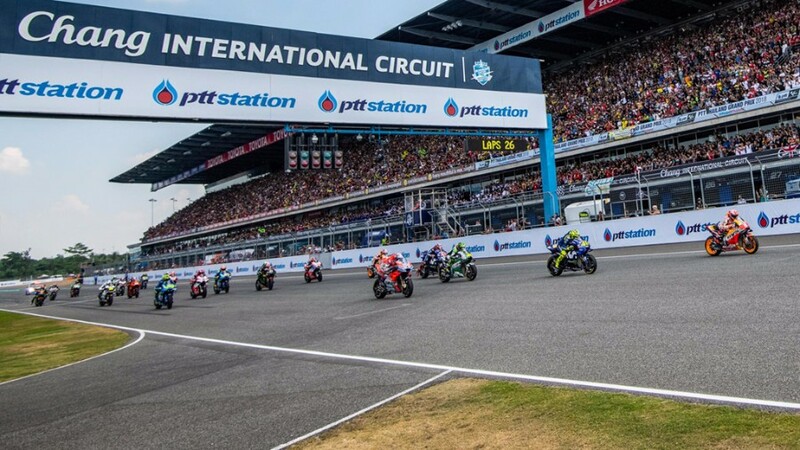 In the race, five riders Marc Marquez, Valentino Rossi, Andrea Dovizioso, Cal Crutchlow (LCR Honda) and Maverick Vinales competed from the beginning. 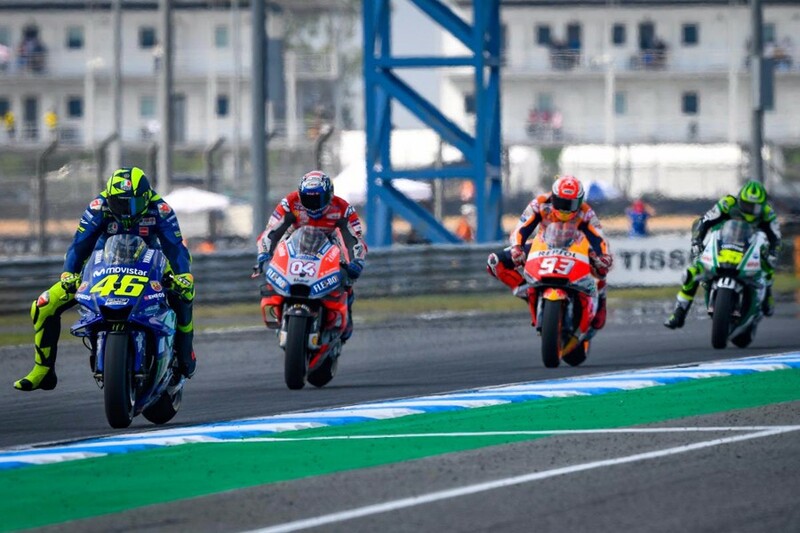 Marc Marquez led the race until four laps, Valentino Rossi overtook Marc Marquez and moved up to the top. 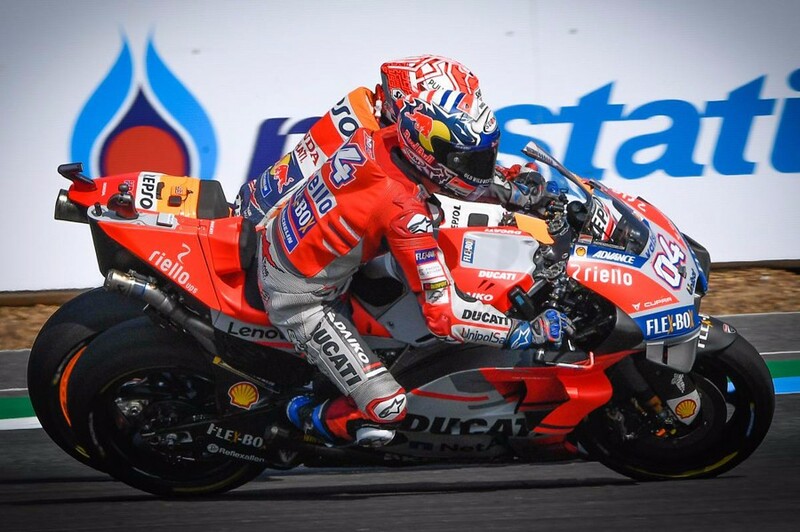 Followed by, Andrea Dovizioso passed Marc Marquez and move to 2nd place. 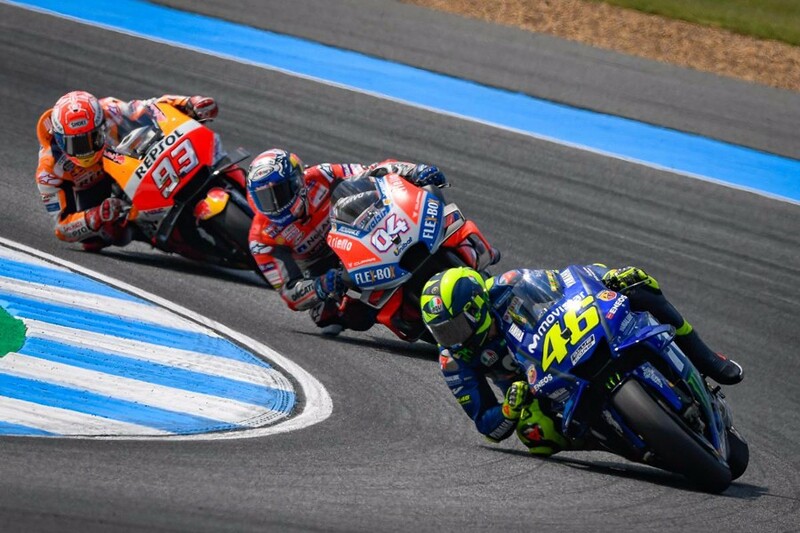 Andrea Dovizioso and Marc Marquez passed Valentino Rossi on lap 10. 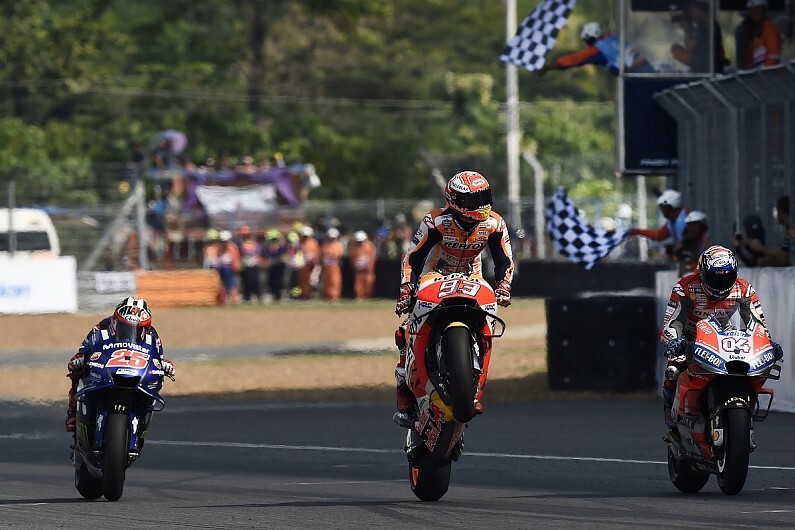 Since then, Andrea Dovizioso and Marc Marquez battled for the top. 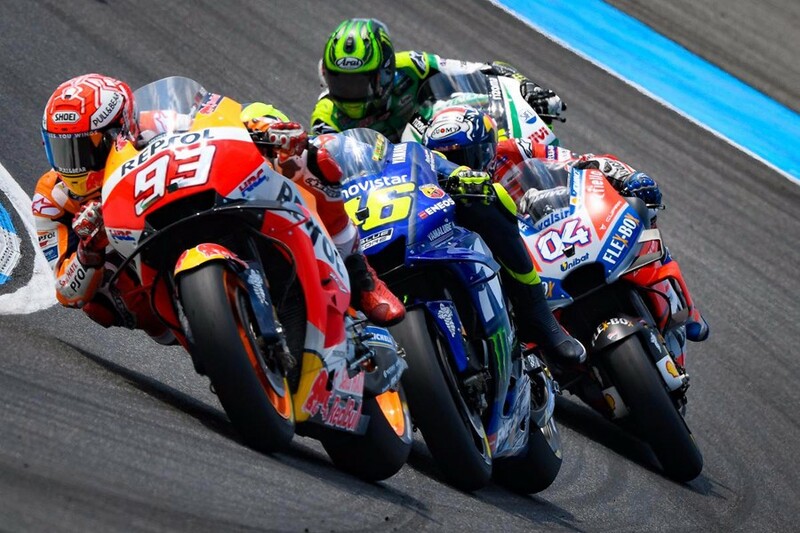 Maverick Vinales moved up to fourth on lap 18 and overtook Valentino Rossi on 5 laps to go. Marc Marquez moved up to the top on 2 laps remaining. But Andrea Dovizioso got back to the top quickly. 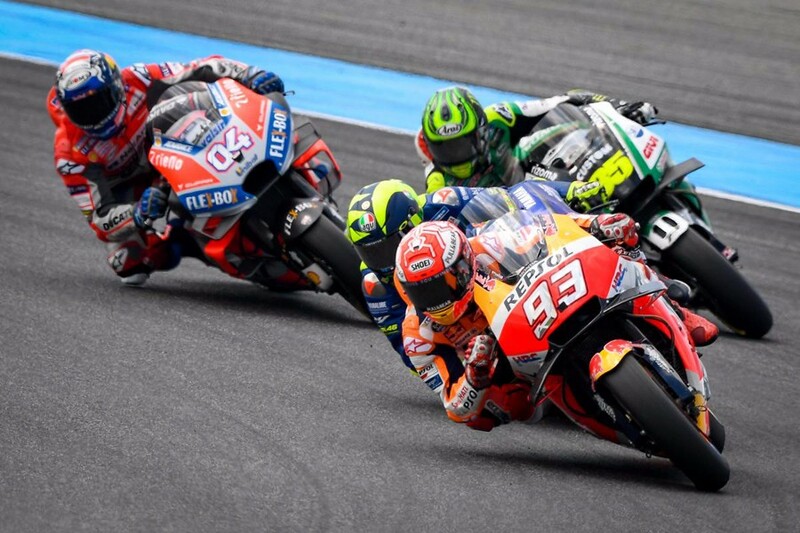 On the final lap, Marc Marquez overtook Andrea Dovizioso again and won the race. “In the end we got revenge after (losing) three times and the fourth time we changed the styles a little bit, but honestly speaking my strategy was another one, to try to push when there remained ten, eight laps more or less. 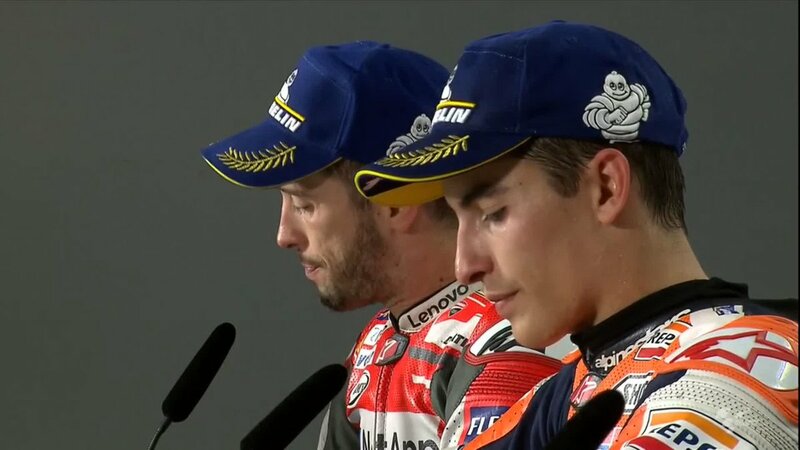 I saw that Dovi’s pace was good and I was able to be slightly faster, maybe, but I wasn’t able to overtake him because my front tyre was overheating and I wasn’t able to stop the bike on the brake points. 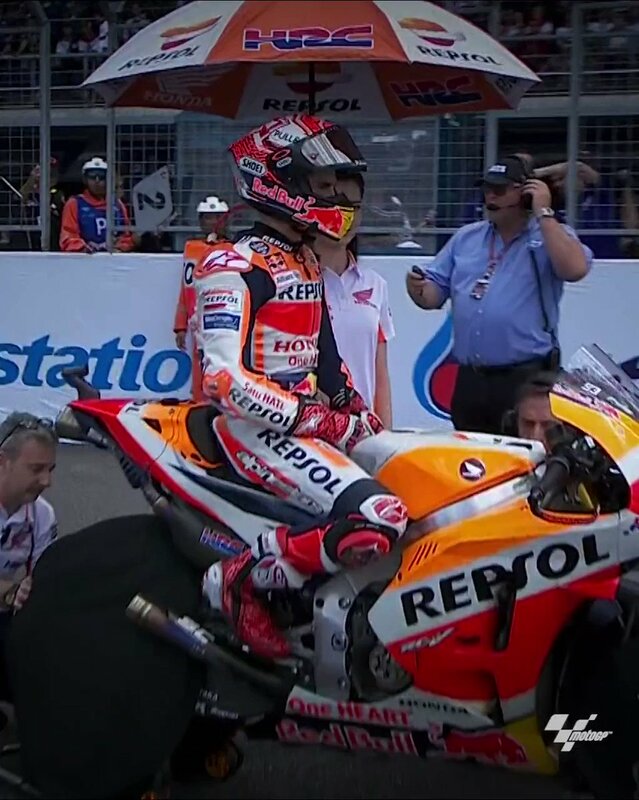 For that reason I tried to attack before the last lap, to try to cool down a little bit the front tyre, but Dovi was really smart and he overtook me really quick every time. Then I said okay, we will see on the last lap. I tried to forget everything, the championship, all these things and I just give all that I have. 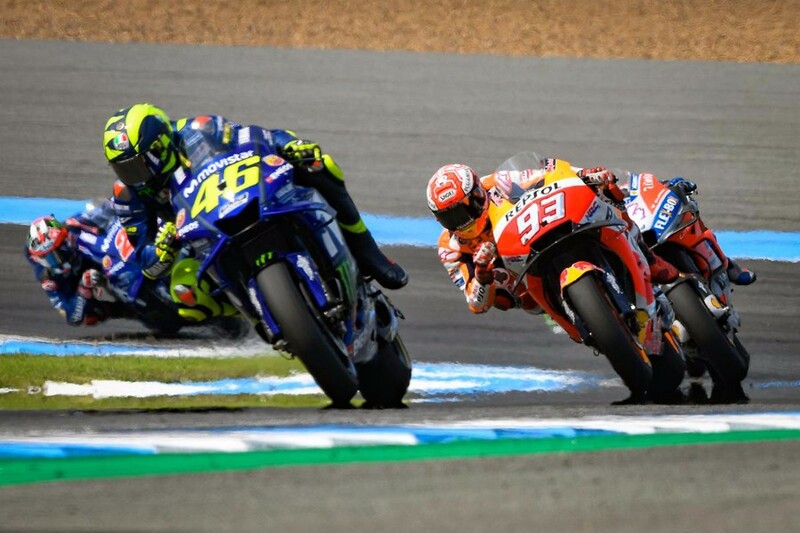 My goal was to try and arrive on the last corner in front because when three laps remained, I tried to overtake him there but I was not able to stop the bike in a good way and he overtook me. 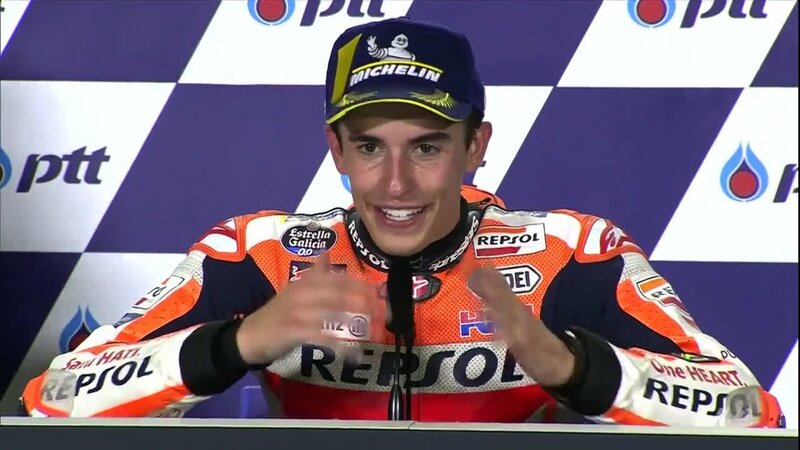 So we changed places and I did like Dovi style and he did Marquez style, and in the end it finished in a good way for us. The race went exactly like I expected. I tried to push in the first four laps but I saw that the feeling was not the perfect one, with the full tank and all these things, so I prefer to be behind them. But then I overheated the front tyre and I never recovered. 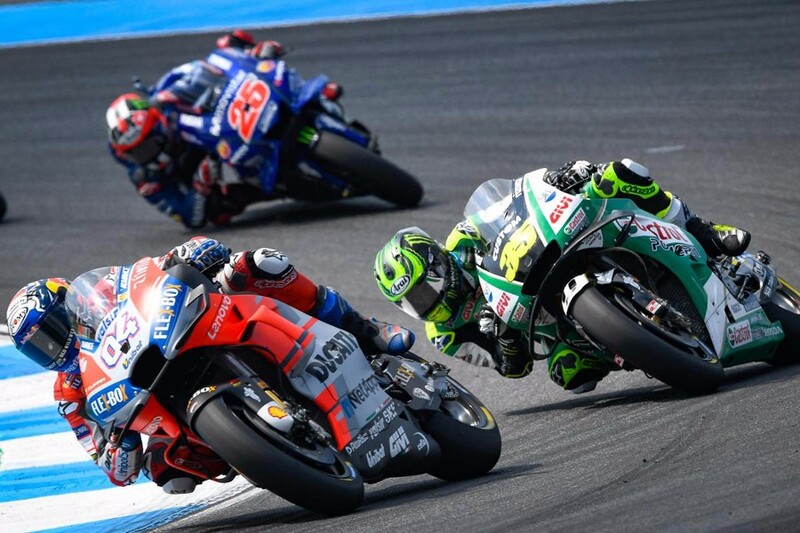 I was losing the front all the time but both Yamahas were very strong at this track, but the strongest one was Dovizioso. He deserves also this victory, but in the end, last corner, and the last five laps were very nice for the Thai fans. I feel in the Japanese staff all weekend that they had a special motivation to have the first match ball in front of our big boss, so I was pushing a lot and they were pushing a lot all weekend.